If staying entertained on your drives is important to you, take a look at the 2018 Audi A7. This popular large luxury car is equipped with high-tech gear that provides you with seamless connectivity and crisp audio. The A7 lets you use a familiar interface on the infotainment center. It has Apple CarPlay and Android Auto integrated seamlessly into the Audi Connect system. You can pair your mobile device to the car with Bluetooth technology. The corresponding operating system will be mirrored onto the bright and responsive screen. You'll be able to browse your music library, use popular streaming services, and much more. Your media will have impressive clarity thanks to the Bose sound system. It has 14 speakers that produce 630 watts. There's also a 10-channel amplifier. 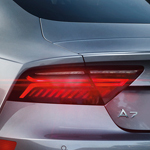 Want to learn more about the 2018 Audi A7? Stop by Audi Downtown LA today to take it for a test drive.